Children's Book and Media Review – ¡Que Vivan los Recolectores de Basura! ¡Que Vivan los Recolectores de Basura! ¡Que Vivan los Recolectores de Basura! is the Spanish version of Hooray for Garbage Collectors!, a book in the Hooray for Community Helpers! collection. In this book, the role of garbage collectors is talked about in depth, showing what they do every day, from sorting recycling to cleaning parks to picking up the trash in front of your house. Filled with real photos of every day garbage collectors, this book is an outstanding addition to the collection. Each book in this collection highlights an important job in the community such as a doctor, dentist, or policeman. 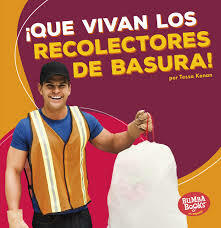 ¡Que Vivan los Recolectores de Basura!, however, is different in that it highlights a job that is often looked down upon, helping children to realize that even garbage collectors make a big difference in the community. There are questions throughout the book to help facilitate conversation or more in depth thinking about what is being read. This book would be a great way to introduce the idea of recycling to a child or group of children. The glossary at the back adds to the book by defining words that are found throughout and helping to increase understanding of key vocabulary.